Some time ago, I posted about using interlaced video to display 3D images. Whilst the idea works very nicely in theory, it's quite tricky to get modern video cards to generate interlaced video at a variety of resolutions and refresh rates. My card limits me to 1920x1080 at i30 or 1920x1080 at i25, and only lets me use this mode on my LCD when I really need it on a CRT. Even if you can coax the video card to switch to a particular mode, this is quite a fragile state of affairs as full-screen games will switch to a different (and likely progressively scanned) mode. 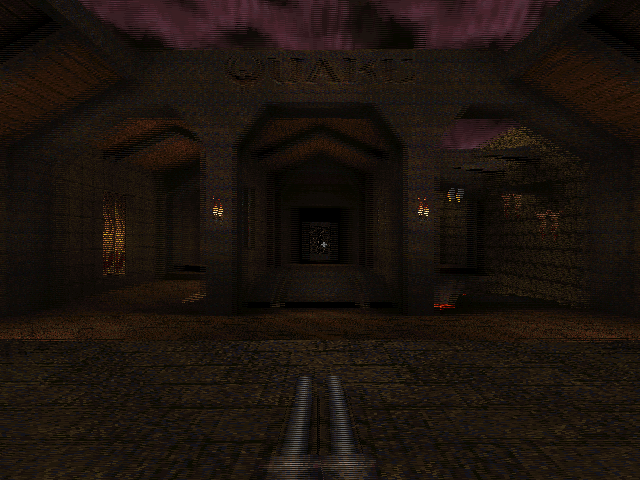 The crosshair is added after the 3D view is rendered (in fact, Quake just prints a '+' sign in the middle of the screen using its text routines), which explains its incorrect position - Quake doesn't take the previously halved height of the display into consideration, causing the crosshair to be drawn with a vertical position of half of half the height of the screen. That's pretty easy to fix - if LCD_X is non-zero, multiply all previously halved heights and Y offsets by two before rendering the crosshair to compensate. After a bit of digging, it appeared that the vid structure, which stores fields such as the address of the graphics buffer and its stride, was being modified between calls to the renderer. 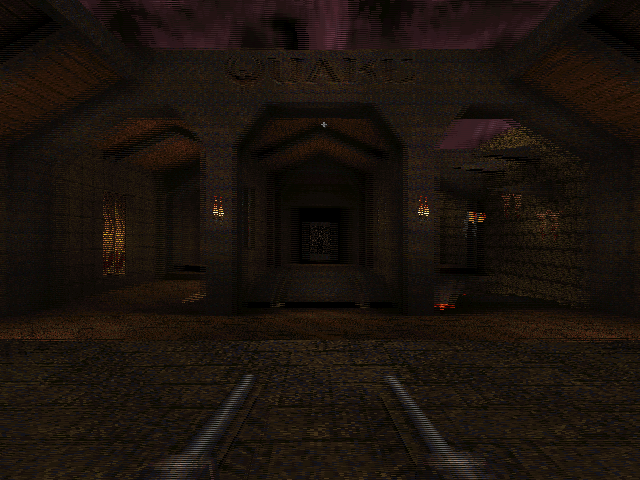 It seemed to be reverting to the actual properties of the graphics buffer (i.e. it pointed to the top of the buffer and stored the correct stride of the image, not the doubled one). Further digging identified VID_LockBuffer() as the culprit; this does nothing if you're using the dib rendering mode, but locks the buffer and updates the vid structure in other access modes. Fortunately, you can call this function as many times as you like (as long as you call VID_UnlockBuffer() a corresponding number of times) - it only locks the surface and updates vid the first time you call it. By surrounding the entire 3D rendering routine in a VID_LockBuffer()...VID_UnlockBuffer() pair, vid is left well alone, and Quake renders correctly in full-screen once again. The final issue was the extreme stereo separation of the player weapon, caused by its proximity to the camera - it does make the game quite uncomfortable to play. The game moves the camera and weapon to the player's position, then applies some simple transformations to implement view/weapon bobbing, before rendering anything. 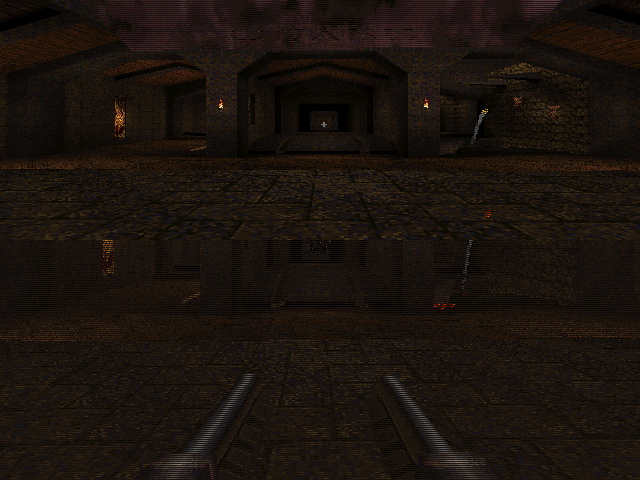 Applying the same camera offset and rotation to the player weapon as the camera when generating the two 3D views put the weapon slap bang in the middle of the screen, as it would appear in regular "2D" Quake. This gives it the impression of a carboard cutout, and can put it behind/"inside" walls and floors when you walk up to them; I've added a console variable, LCD_VIEWMODEL_SCALE, that can be used to interpolate between the default 3D WinQuake view (value: 1) and the cardboard cutout view (value: 0). You can download the replacement WinQuake from here - you can just overwrite any existing executable. (You will also need the VC++ 2008 SP1 runtimes, if you do not already have them). Source code is included, and should build in VC++ 2008 SP1 (MASM only appears to be included in SP1, which is required to compile Quake's extensive collection of assembly source files). You know what would be double-awesome? 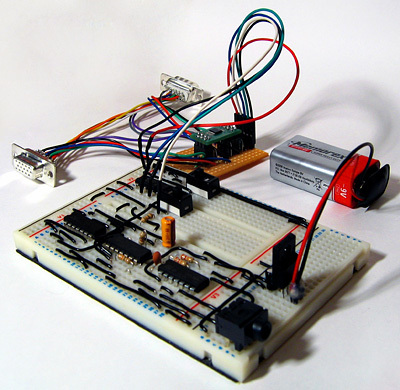 Combining that with Promit's binaural audio API to get "true 3D". That'd be too cool. Cheers. [smile] And that would be cool indeed!